Is this a world first? For what is believed to be the first time in the history of Second Life, and probably in the history of virtual worlds, a Maori Kaumatua (respected elder) has conducted a public ceremony of blessing in a virtual building with an avatar. The ceremony was conducted by Manukau Institute of Technology Kaumatua Wati Ratana (SL: Matua Mistwood) on the Foundation Learning build on the SLENZ Project island of Kowhai. Arranged and facilitated by Manukau Institute of Technology lecturer and SLENZ Project lead educator, Merle Lemon (SL: Briarmelle Quintessa) the ceremony was attended by leading members of the SLENZ Project and other guests. Ceremonies of this nature are part of the normal dedication of New Zealand-Aotearoa public buildings both in New Zealand and abroad. However, it is believed that this was the first time an event of this nature had been held in a virtual world. The ceremony included an informal welcome, known as a whakatau, because a karanga (formal welcome to a marae) was not considered appropriate, according to Lemon.The cermemony commenced with a karakia (prayer) offered by Matua Mistwood. DaKesha Novaland (RL: Whaea Helen Rawiri) was present to support Matua Mistwood. For the ceremony Mistwood wore a kiwi feather korowai (cloak) made especially for the occasion and donated by Second Life builder, Theo Republic, of Adelaide, Australia. Kaumatua Wati Ratana and Kuia Waea Helen Rawiri, and another helper. After hongi (a traditional Maori greeting) were exchanged via HUDs worn by participants, Kaumatua Mistwood proceeded to enter the Foundation Learning build’s Whanau Room alone to pronounce the blessing. He later blessed the “food” which was served in world to all guests at the conclusion of the ceremony. “Despite some small technical hitches, It was a really good experience,” Lemon said after the function. “We made history having an actual Kaumatua come into a Second Life build to bless a room for students. To my knowledge it has never been done before in a virtual world. 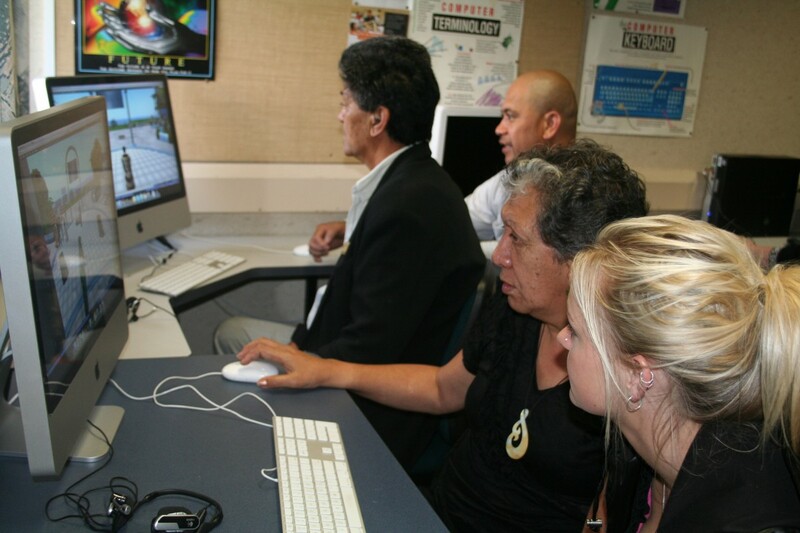 “I really loved being able to bring a Kaumatua and a Kuia into Second Life, Their first impression was that it would be a wonderful for the education of Maori students, particularly in Te Reo and literacy programmes. 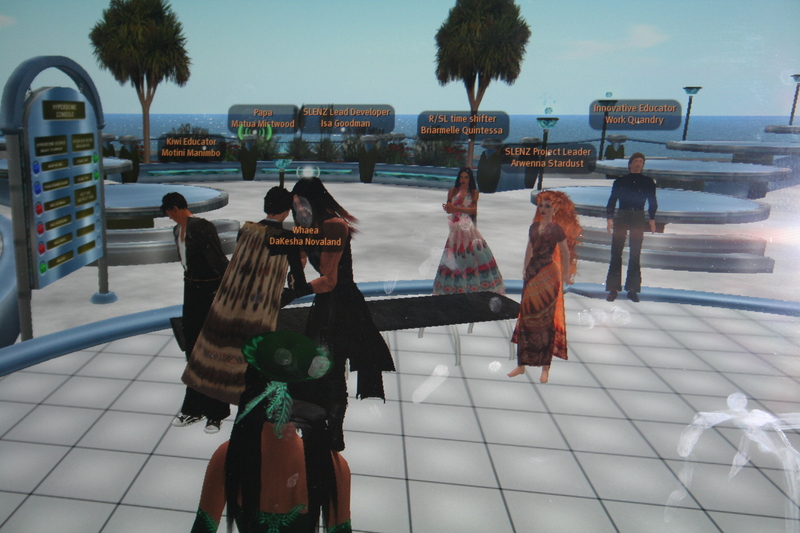 “They even talked of building a 3d version of a full Maori marae in a virtual world like Second Life,” Lemon said. The SLENZ Project which has run two pilot education programmes in Second Life is funded by the New Zealand Government’s Tertiary Education Commission. Kaumatua Matua Ratana greets participants with a traditional hongi. *All pictures in this blog issue taken by Dave Snell, LTC. Students at Manukau Institute of Technology (MIT) are set to become the first in New Zealand to learn how to succeed in getting a job in real life through training in a virtual world. The initial 31 students in the Foundation Learning Future Focus career planning classes will enter the virtual world of Second Life with their lecturers on Monday (August 17). They will later be joined by other Foundation Learning students from MIT as well as NorthTec and Otago Polytechnic. The pilot programme, which is part of the Second Life Education New Zealand (SLENZ) Project, will eventually see more than 160 students ranging in age from 18 to 45 doing some of their classes as avatars in Second Life, a virtual world which has been in existence since 2003. The research project is being funded by the Tertiary Education Commission of New Zealand under its Encouraging and Supporting Innovation funding programme. The SLENZ Project is also running a distance education pilot programme in midwifery with Otago Polytechnic. Expressing excitement at having two pilot programmes under way, Terry Neal (SL: Tere Tinkel) (pictured top right), joint leader of the SLENZ Project, said, the Foundation Learning pilot was quite different from the midwifery pilot where the project team had been learning how to motivate and encourage distance learners to engage with Second Life. “The Foundation learners will be in a computer lab with their teacher so we do not have the same challenges getting them there,” she said. “The team has designed a highly interactive experience which we hope will be lots of fun as well as effective. In the MIT programme, led by SLENZ lead educator and MIT lecturer Merle Lemon (SL: Briarmelle Quintessa), the students will learn interview techniques through role-playing for possible positions in travel and tourism, business, engineering, social work, teaching and nursing training. 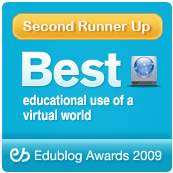 Second Life had been chosen for them to learn interviewing skills, something they all need but which is not easy to practice in a classroom environment for a variety of reasons, she added. “Second Life gave us an opportunity to deal with more students at the same time as well as making the learning engaging,” Merle said. “We are trying to make the learning process as motivating and exciting as possible to overcome any previous negative experiences in school. “Second Life engages the students actively in the process of learning and offers them everything they need to succeed,” she said. Tina Fitchett (pictured bottom right), Dean of MIT’s Faculty of Education and Social Science, believes that virtual learning may hold the key to learning success for foundation students. “This is also a great example of tertiary providers working collaboratively together to enhance their students’ learning,” she added. Merle has collaborated closely with the head of the MIT Learning Technology Centre, Oriel Kelly (SL: Noumea Sands) and SLENZ Lead Developer and contract SL builder, Aaron Griffiths (SL: Isa Goodman) in the creation and development of the virtual world learning programme, stage 1 and Stage 2 on the SLENZ island of Kowhai. Other lecturers for the foundation programme include Maryanne Wright (SL: Nugget Mixedup), Tania Hogan (SL: Tania Wonder), NorthTec’s Martin Bryers (SL: Motini Manimbo), Vicki Pemberton (SL: Sky Zeitman) and Clinton Ashill SL: Clat Adder) and Otago Polytech’s Jane Fields (SL: Morgana Hexicola).